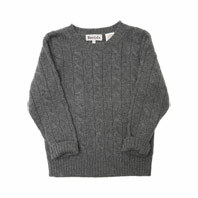 $198 cashmere sweater from Best & Co.
which offered the opportunity to buy $98 corduroys and $198 cashmere sweaters for my 4-year old. Outside of the proof that marketers don’t yet know everything about us — the catalogue definitely arrived in the wrong house — it got me thinking: how much is “too much” when it comes to consumption? As a friend of mine once described about religiosity, it’s common to think that everyone less religious than you has no values or spirituality, and everyone more religious is some sort of kook. Which may be why I let myself off the hook for buying at Whole Foods or for the occasional tin of Stonewall Kitchen Pancake Mix (yum!) as an occasional luxury, but decide that $100+ for kids cords is borderline offensive. I’m not arguing for a society without luxury — in fact, luxury goods played an important role in consumption over the past decade and in some ways drove the U.S. economy (let alone being things of beauty). I’m more curious about how any society tramits a system of values that determine what to consume, what to save, and what to give away. Religion is probably a good starting point, inasmuch as it emphasizes community, piety, charity, and giving. Leading by example is likely another, which is why Bill Gates and Warren Buffett should be praised both for giving AND for showing the world what is expected of people with great wealth. This question will only become more important as more wealth is created in the Middle East, India, China, and other emerging nations. Is there anything that can be done that can strengthen and reinforce the impetus to give and support those in needs? And how big a role should breakthrough non-profits play in setting an example of what can be done with philanthropic dollars? Next ›What have you noticed lately?